Officer stopped to check on the couple in this SUV. What they found inside isn't what they expected! Home / Life / Officer stopped to check on the couple in this SUV. What they found inside isn't what they expected! Dan Templeton, an officer at the Elk Grove California thought that it would be just an ordinary day for him. He was on his way to his work when hi noticed an SUV containing a frenzied couple. Officer Dan Templeton knew that something's not right in the situation so he decided to turn on the dashboard camera just in case something happens to him. But what they discovered in the SUV isn't really what they expected it to be. When he opened the doors of the car, he saw the woman named Vanessa who was about to g*ve b*rth to her child in the SUV and they had no idea what to do. 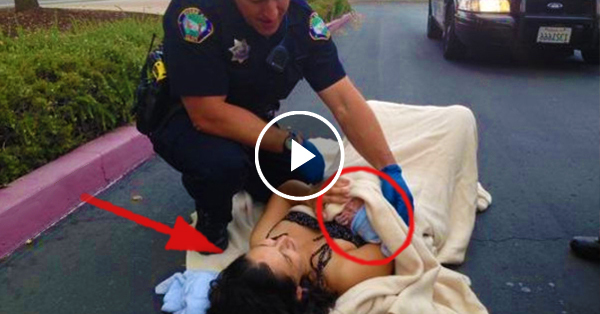 Knowing that he could g*ve out some help, officer Templeton quickly grabbed a blanket and let the woman lay down on the road. They noticed that the baby was slowly turning blue and that he stopped breathing, but on the third push, they were able to deliver the baby safely. This is indeed one of the most remarkable moments in this officer's life.